ProjectSAM periodically releases free updates for its libraries, adding new features and, often, new sample content. Product updates are listed per registered library in your ProjectSAM account. We also send out e-mail notifications to all registered users when a new update is available. Please note that the Native Access application also lists a version number for all activated ProjectSAM libraries. It is important to know that this version number is saved upon activating the library and not updated after that. The version number in the library’s interface is, therefore, more reliable. If a newer version of your library is available in your ProjectSAM account, it is worth checking if your version of Kontakt, as well as your operating system, are compatible. While Kontakt can be updated easily from Native Access, a newer version of Kontakt may have different OS requirements. 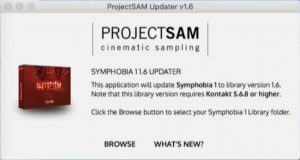 The Kontakt version required for the available library update is listed as part of the update, in your ProjectSAM account. Each library update has a dedicated ProjectSAM Updater app for Mac and Windows. These, again, are available from your ProjectSAM account. Once the app is running, the updating procedure is very straightforward and only requires you to locate the existing Library folder. When you update a library, this may have consequences for existing DAW projects that use instruments from the library. While we work hard to maintain full backwards compatibility with earlier versions and projects, there may be small issues when opening older projects, such as misaligned controls or a missing interface graphic. This can be fixed by unloading the instrument and then reloading the updated version of the same instrument on the same track. However, do keep in mind that playback may be slightly different if aspects like the instrument’s velocity response, mod wheel curve or mic channel gains were tweaked as part of the update.